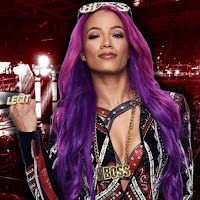 Sasha Banks recently spoke with journalist Vicente Beltran while doing international media for WWE. Banks was asked if her Royal Rumble match with RAW Women's Champion Ronda Rousey was a dream match. She was blunt with her response. "No," Banks said. "It was a dream match for her, though. She said it." Banks and Bayley have previously expressed interest in wanting to defend their titles against WWE Hall of Famers Lita and Trish Stratus, and that match was rumored a while back. When asked if she's disappointed that they won't get to defend the titles against Trish and Lita at WrestleMania 35, Banks said she is not disappointed and it's still amazing that they got to work with the Hall of Famers a few months back. Banks also said they are very happy with who they are defending against at WrestleMania, but one day she hopes they will get the chance to defend against Trish and Lita. Banks also asked how they would react if Triple H booked them to defend their titles on an upcoming WWE NXT Takeover event. A match with Banks and Bayley defending against Kairi Sane and Io Shirai has been rumored. Banks said they really want to make the titles very important and they really are up for defending them on any show. "I think that would be amazing," Banks said of possibly defending at a Takeover show. "That's exactly what me and Bayley want to do, we want to take these titles all over the world. Whether it's RAW, SmackDown, NXT, NXT UK, it doesn't matter. It could be any team, any place, any time. We really do want that, we want to take over the world and we want to make the tag team titles very important." Banks and Bayley will defend their titles in a Fatal 4 Way at WrestleMania 35 against Nia Jax and Tamina Snuka, Peyton Royce and Billie Kay, plus Natalya and WWE Hall of Famer Beth Phoenix.